Customers who lead the world in their industries. Typically our customers occupy the number 1 to 3 spots in their respective industries such as oil and gas (Total), banking (BNP Paribas), mining (Rio Tinto), optics (Essilor), rail (Alstom) and retail (Carrefour). Top marks for customer satisfaction. In our latest annual satisfaction survey, 99.3% of our customers said they would recommend us. For on-time delivery, linguistic quality, fast response times and price we were given 5 stars, 4.9, 4.9 and 4.8 respectively. 30 years of experience. Lexcelera has been providing translation services continuously, under the same management, since 1986. 24-hour availability. With production offices in Paris, Buenos Aires and Singapore, in addition to the sales offices in London and Vancouver, Lexcelera’s customers can receive answers to their questions or the delivery of their documents, 24 hours a day. ISO 9001 quality certification. 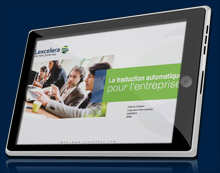 Lexcelera was the first French translation company to be awarded ISO 9001:2000 certification for its quality management system. Translators without Borders. As the founder of the world’s largest translation charity, we take Corporate Social Responsibility seriously. A woman-owned translation company. 100% woman owned with a diverse international team: diversity helps us think out of the box. Connected talents, Trusted technology. Lexcelera was one of the first translation companies in the world to recognize the value of having the most talented linguists in the world optimize Machine Translation (MT) technology. Fast response times. Our customers are busy people. And the number one quality they thank us for is our fast response times. We respond quickly so they can too. We make global easy. Our expertise and our streamlined ordering procedures make global communications easy so our customers can focus on other things. You want to work with Lexcelera?